From the New York Times-bestselling author of The Interestings, comes an electric novel not just about who we want to be with, but who we want to be. To be admired by someone we admire—we all yearn for this: the private, electrifying pleasure of being singled out by someone of esteem. But sometimes it can also mean entry to a new kind of life, a bigger world. Greer Kadetsky is a shy college freshman when she meets the woman she hopes will change her life. Faith Frank, dazzlingly persuasive and elegant at sixty-three, has been a central pillar of the women’s movement for decades, a figure who inspires others to influence the world. Upon hearing Faith speak for the first time, Greer—madly in love with her boyfriend, Cory, but still full of longing for an ambition that she can’t quite place—feels her inner world light up. And then, astonishingly, Faith invites Greer to make something out of that sense of purpose, leading Greer down the most exciting path of her life as it winds toward and away from her meant-to-be love story with Cory and the future she’d always imagined. 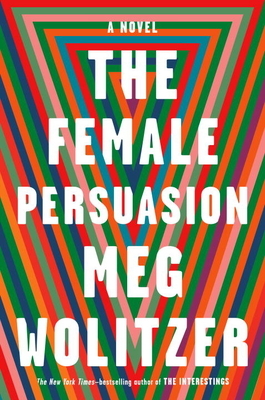 Charming and wise, knowing and witty, Meg Wolitzer delivers a novel about power and influence, ego and loyalty, womanhood and ambition. At its heart, The Female Persuasion is about the flame we all believe is flickering inside of us, waiting to be seen and fanned by the right person at the right time. It’s a story about the people who guide and the people who follow (and how those roles evolve over time), and the desire within all of us to be pulled into the light. Meg Wolitzer is the New York Times-bestselling author of The Interestings, The Uncoupling, The Ten-Year Nap, The Position, The Wife, and Sleepwalking. She is also the author of the young adult novel Belzhar. Wolitzer lives in New York City.